Allied operations in Mesopotamia (largely present-day Iraq) were against the Turks, staunch fighters and allies of the Germans. On 23 October 1914 British Indian Army troops, who were already in Bahrain to protect the oil refineries there, invaded southern Mesopotamia and advanced up the Tigris Valley. They soon captured the important city of Basra, and were reinforced. Turkish attacks were repulsed, and late in 1915 the British advanced again through Kut-el-Amara and on north towards the Mesopotamian capital of Baghdad. But by the end of the year Major-General Charles Townshend, who had taken over command of operations, found himself besieged in Kut. In April 1916 Townshend surrendered the town, along with 6,000 Indians and 2,070 British soldiers. A force of Indians under General Fenton Aylmer had tried repeatedly and unsuccessfully to relieve Kut, and had suffered over 21,000 casualties. Nonetheless, by December 1916 the British renewed their advance up the Tigris with 166,000 men - over 100,000 of them Indians. On 11 March 1917 they entered Baghdad. 1917-18 saw a continued Allied advance northwards through the rest of Mesopotamia, and on to the Caspian Sea and to the Mosul oilfields. These were taken over on 14 November 1918, just before the end of the war, at which time there were reckoned to be 260,000 Indian soldiers in Mesopotamia – three times as many as the British contingent. It had taken the Allies four years and cost 80,000 casualties to drive the Turks out of the Mesopotamian oilfields. Altogether, some 675,000 Indian fighting troops saw service in Mesopotamia, as well as hundreds of thousands of auxiliary troops. Without the work of the Indian auxiliaries on the Mesopotamian railways – which supplied almost every requisite for fighting and for everyday living on campaign – the Allied forces would never have enjoyed the victory they achieved. After the war, Mesopotamia – now renamed Iraq - was governed by Britain under a League of Nations mandate. 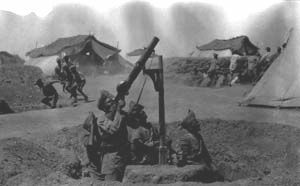 From 1920 British and Indian troops were involved in fighting with Arab rebels during uprisings against British rule, which finally ceased in 1932 when Iraq became independent.